My last post originally had some moves shown, where I misread my 1973 edition of I.A. Horowitz's Chess Openings. 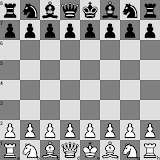 The final move was written in the book "B-N5", with a symbol after it meaning the opponent was in check. I missed the check symbol at the time, and moved the other bishop, which could also move to its respective N5 square. I didn’t notice at the time that both bishops could move to their own Knight’s 5th square on opposite sides of the board. The end position confused me, and I planned on coming back to analyse it more. Today, after analysing it and getting nowhere with the supposedly great move, I realised my mistake, and have corrected the post. I originally learnt to read chess moves with the old notation, and for some reason enjoyed reading a game written with it more, compared to algebraic notation, but this example has shown me that algebraic has much less chance of being misunderstood. "B-b5" could never accidentally imply the other Bishop’s move, even if you missed the check symbol that might be there. 1. e4 e5 2. Nf3 Nf6 3. Nxe5 Nxe4 4. Qe2 Qe7 5. Qxe4 d6 6. d4 Nd7 7. Nc3 dxe5 8. Nd5 Nf6 9. Nxf6+ gxf6 10. Bg5!